This training document has been designed by module so that it can be used in departmental meetings, without the need for external aid. It is an à la carte menu that, in practice, resembles more of an organized reflection than a “training” session in the traditional sense of the term. Those with a large appetite can work their way through all of the modules. Others can select only those subjects that particularly interest them in departmental life. This format leads at times to a certain, though limited, amount of repetition from one module to the next. The document is available in either electronic or print format; it includes accompanying documents that expand more fully on certain concepts or provide detailed examples. Some union executives will be touring the departments during the course of the semester. In preparation for this or for any departmental meeting, we suggest that the department coordinator read the introduction and module subjects to the department in order that choices may be made. In the departmental meeting, a brief presentation of the module can be made. Questions can be asked to ensure that all is clear, followed by a discussion. 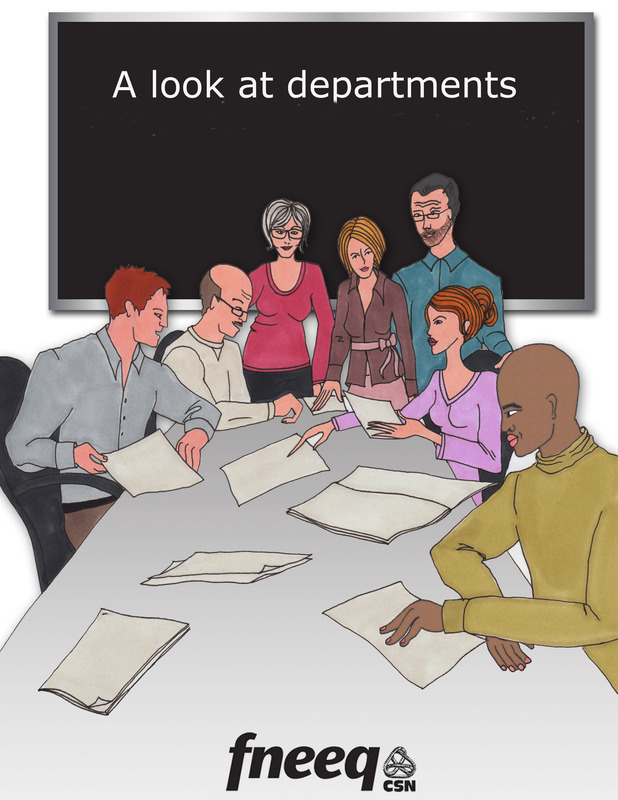 This may be of greater interest if the objective is clearly identified ahead of time as being to improve department life with regard to the module theme chosen. The following pages were designed to support such an approach. We hope that this may contribute to maintaining an active and dynamic department and that it allows as many teachers as possible to blossom professionally.